Synovial joints have a synovial cavity between the articulating bones. This cavity is filled with synovial fluid that reduces friction at the joint, enabling the articulating bones to move freely. Synovial joints are freely movable joints. A formal medical term is 'diarthroses' but synovial joints are commonly described as simply 'movable' or 'freely movable'. Most of the main joints of the appendicular skeleton (including the arms and hands, and the legs and feet) are synovial joints. This type of joint is important in many health sciences, not just medicine and nursing but also physiotherapy, sports sciences, occupational therapy, massage therapies and so on. The basic structure of a synovial joint is shown in the diagram on the right. The main parts of synovial joints are labelled on the synovial joint diagram and described in the table below. Some synovial joints are more complicated than others. An example of a simple synovial joint, e.g. a metacarpophalangeal (finger) joint, is shown above-right. More complicated synovial joints can involve more than two bones, might include sesamoid bones e.g. the patella in the knee joint, might include bursae, and possibly accessory ligaments. An example of a general (more complex) synovial joint follows after the table. There are at least 2 bones forming each joint. An example of a simple synovial joint is the 3rd metacarpophalangeal (MCP) joint, which is formed by two articulating bones, the 3rd metacarpal and the 3rd proximal phalanx. Periosteum is a tough white fibrous membrane that covers the outer surface of bones wherever their surface is not covered by articular cartilage - see below. 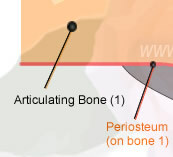 Periosteum is sometimes labelled on synovial joint diagrams to distinguish the areas of bone covered by articular cartilage from the other surfaces of the bone(s). Articular cartilage is hyaline cartilage (a bluish-white, shiny ground elastic material within a matrix of chondroitin sulphate containing many fine collagen fibrils and numerous chondrocytes). Reduces friction - helped by its coating of synovial fluid: As the load on the joint increases the spongy cartilage absorbs water, increasing the proportion of lubricating hyaluronic acid in the lubricating film. Absorbs shocks - shock absorber effect helped by contribution from the bone itself immediately behind the layer of articular cartilage. The synovial membrane is a layer of loose connective tissue that includes both elastin fibres and adipose tissue. Note that several different words are used to refer to meniscal cartilage. Mediscus and meniscus are the singular forms, for which medisci and menisci are the corresponding plurals. These are pads of fibrocartilage that enable articulating bones whose shapes do not match each other exactly to fit more snugly together. This extra pad of cartilage within the synovial cavity can also contribute to the absorption any mechanical shocks to the joint. 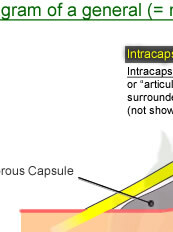 'Intracapsular' means located inside the articular capsule. Intracapsular ligaments are, however, surrounded by folds of synovial membrane. An example of an intracapsular ligament is any of the cruciate ligaments of the knee joint. 'Extracapsular' means outside of the articular capsule, though an extracapsular ligament may be fused with (attached to) the articular capsule. An example of an extracapsular ligament is the fibular collateral ligament of the knee joint. 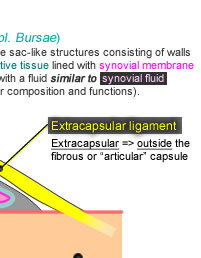 Bursae are sac-like structures are present in some synovial joints. The function of bursae within synovial joints is to reduce the mechancial friction between one structure e.g. a bone and another e.g. an extracapsular ligament, during movement of the structures relative to each other. 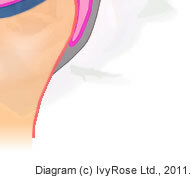 Note: The above labelled diagram of a synovial joint above is not a drawing of any specific joint and the tissues and membranes labelled are not to scale. Some courses require more detailed knowledge of synovial joints (incl. e.g. bursae and accessory ligaments) than others. Refer to the synovial joint diagrams used in your class or course notes as you may only need to learn a simple diagram of a synovial joint - such as that shown at the top-right of this page. Conversely, more advanced anatomy courses require students to learn and be able to sketch specific synovial joints, e.g. knee joint and elbow joint - not included on this page. This page concerns the general structure of synovial joints, i.e. the list of components of synovial joints in the table above and the diagrams showing how the bones, ligaments, and soft tissues are arranged. Synovial joints can be sub-divided into 6 types according to the shapes of the surfaces of the articulating bones and therefore the types of movement enabled by the joints. These are described on the page about types of synovial joints. This is the end of this page about synovial joints. See also types of joints, features on bones, the structure and functions of bones, the 206 human bones, cranial and facial bones, bones of the feet and hands and skeletal disorders.